JULIA SPENCER-FLEMING: Usually my Sunday recipes are some variation of an easy dinner, because what else is Sunday for? However, I'm not overflowing with dinner inspiration these days, because I find now I live alone I tend to cook one real meal per week, and flesh it our with quickie pasta and sandwiches. It doesn't sound like much, when when eating solo, a single pot of stew goes a looooong way. 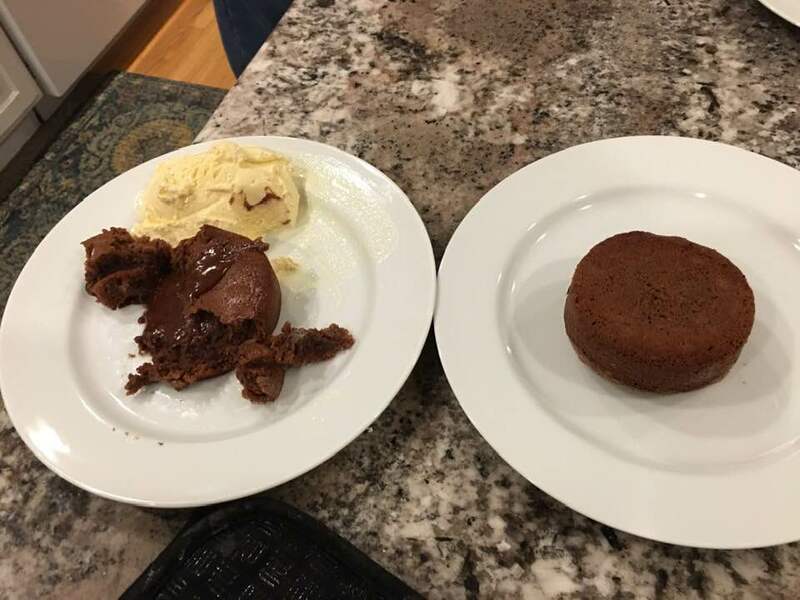 So today, I'm sharing a spectacular, but not too hard dessert courtesy of my friend (and Jungle Reds commentor) Celia Wakefield: Lava Cakes. Celia suggests doing each step all the way through, and don't try to do more than one thing at a time. To that I can add, focus, focus, focus. The second time she made this when I was a dinner guest, I was in the kitchen "helping" (ie, we were both talking nonstop and enjoying rather stiff drinks) and the inner part of the cake didn't remain gushy. This is a recipe that demands strict attention to the measurements and mixing. Celia is British, so she even includes grams for our Canadian and continental readers. These Molten Chocolate Lava Cakes for Two are the perfect small batch dessert! These lava cakes are incredibly easy to make and ready in less than 30 minutes. 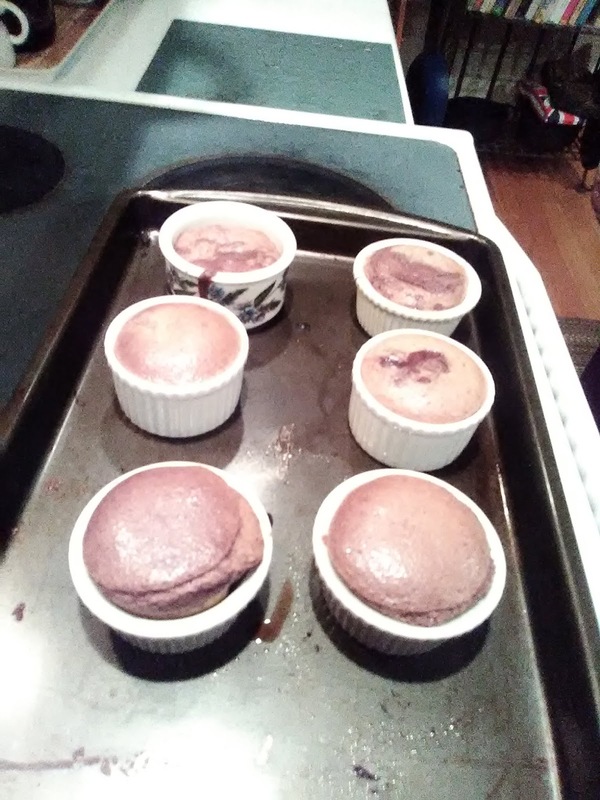 I found that the mix would fill three ramekins and still be a good size. This recipe can be doubled for 6 people. Spray two or three 6-ounce ramekins well with nonstick cooking spray and place on a baking sheet. Set aside. Cut the butter into pieces, and add with the chocolate to a large microwave safe bowl (Pyrex or other glass works well). Microwave in 30 second increments, making sure to stir well after each increment, until melted and smooth. (Do not over cook, recommend taking out after 30 seconds and working the chocolate into the butter with a spatula. It’s a better result for the chocolate). Whisk the powdered sugar into the chocolate / butter mixture until well combined. Mix the eggs and vanilla together, then fold gently into the chocolate mixture until combined. Fold in the flour and espresso powder gently; do NOT over mix the batter. Evenly divide the batter between the prepared ramekins. Bake at 425° for 12-14 minutes or until the edges are firm and the center is slightly soft (the center should look soft and won’t rise). Remove from the oven and allow to stand for a minute. 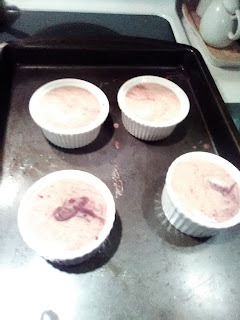 Cover the ramekin with a small plate or bowl and invert. Careful, the ramekin is very hot. Add whipped cream or ice cream, serve, and enjoy! Yum! Lava cake is such a treat; I’m definitely making this! Thanks for the recipe . . . .
this is reminding me of a Joy of Cooking recipe for "lemon sponge custard" which is basically a lava cake but lemon (juice, rind make it super tangy). So delicious and now I need to find the recipe and make it again. I made a chocolate pudding cake the other day and was thinking how great something similar using lemon would be--off to find this recipe! YooHoo Hallie--Flora-- if you find the recipe, please post. I'm looking for new lemony things all the time. This sounds amazing! Hallie, I love anything lemon. That sounds fabulous. Thank you! I think I'll make these for Easter brunch. Do they need to be served hot? This is Celia (unfortunately Google only allows me to posts as Google account), but here I am. To Hallie - I MUST find your lemon recipe, sou s delicious. To Edith - Yes, serve hot, have your ingredients ready then quickly whip up after the main course and they will bake in no time. This is when I give someone the job of clearing while I make da cakes. Julia is too kind to me. I got this from’Debbie’ of the Internet. Another recipe which I haven’t tried said whip up and put in fridge up to an hour before serving, then bake. Julia’s youngest, is why I make these ��. It’s a leSure to give back to Jungle Reds. Thanks “hard working for me” ladies. I have ramkins from a dollar store (Crate and Barrel has them for $3) and will add your recipe to my family favorites file. As I noted above, I make a chocolate pudding cake that sounds similar, except no eggs are used and I'd have to think about how to adapt it for individual servings--this sounds fabulous! And yes, a lemon version would be divine! So deeply yummy! 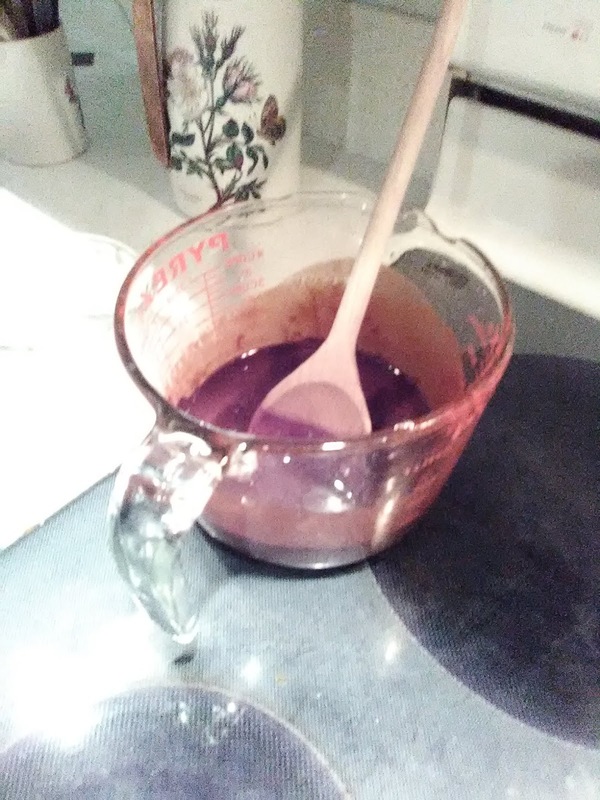 Trying to figure out how to make chocolate AND lemon! My favorite flavor is chocolate, the darker the better. I've made lava cakes once or twice, and they were a big hit. Far too dangerous to make for just the two of us! So fabulous. The recipe sounds delicious, Celia! I can almost see Debs pressing me into service with the dishes while she whips this up for Thanksgiving, or some other festive occasion. And, Julia, I'm with you on meals that last all week. Pot roast is my go-to in the winter because it can become sandwiches, beef tips on noodles or rice, tacos, and gotta-go soup before the week is done. I have invested in a wide variety of beautiful handmade pottery bowls to serve myself such one-bowl meals, so it's always a pleasure to sit down to the table. Ramekins - check. Microwave - will have to use the old double-boiler routine. And it's Sunday.... Plenty of non busy time after church and the ball game. Now I just need to get my lazy self to make it. Sounds divine and blessedly uncomplicated, if you pay attention. Oh this sounds yummy. I love a good lava cake with a generous dollop of French vanilla ice cream. Yum, can't wait to try these! Thanks for sharing. These sound delish! Thank you, Julia AND Celia!